Home Aspire Puxox Kit - 100W - 21700 Battery Included! Aspire Puxox Kit - 100W - 21700 Battery Included! The Aspire Puxos Kit is an incredibly charismatic vaping setup that features some of the most advanced and dynamic properties of any vape on the market. The Aspire Puxos Kit fires up to 100 watts, comes equipped with the new Aspire Cleito Pro Tank, powered by a single 21700, 20700 or 18650 battery, and, best of all, a 21700 battery is included in the packaging! The option of using these larger sized batteries means vapers will be able to enjoy the full potential of the included Cleito Pro Tank's power. The Aspire Puxos Kit features high technology such as an advanced Customized Power Setting (CPS) and extremely accurate Temperature Control (TCR). The Puxos can be used in many different modes, allowing vapers to select between Wattage, Voltage, Bypass, CPS (C1/C2/C3), TC(Ni/Ti/SS316L) and TCR(M1/M2/M3). The Aspire Cleito Pro is included with this kit is a sub ohm tank from the Cleito family. It can hold up to 4.2mL of e-liquid with the included bubble glass and comes equipped with the all new Cleito Pro Coils (60-80W). The Cleito Pro Tank can also use coils from the original Cleito or the Cleito EXO. This has been a pretty solid mod so far. 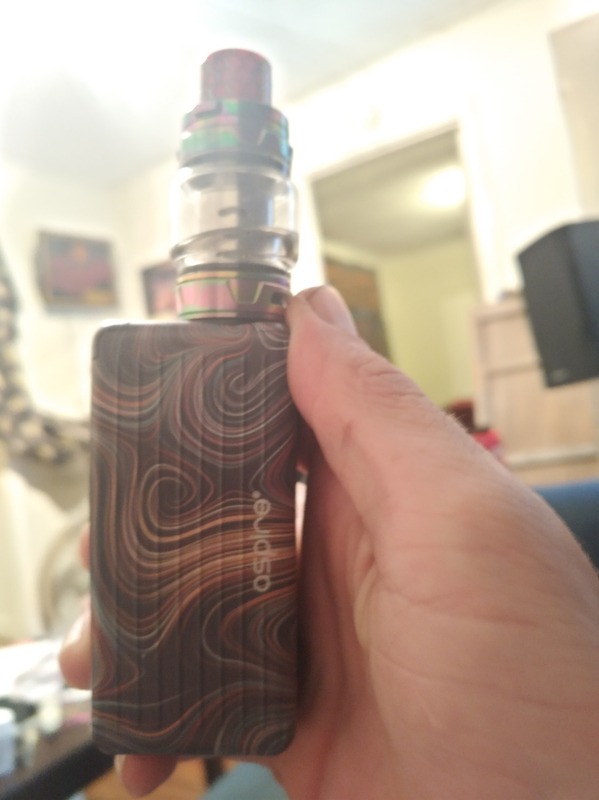 I really have no complaints about the quality of vape it produces. I love that it is light weight, which makes it my preferred choice to take to work vs. something like my Mag 225W. I have been worried about how durable it would be if it took a fall being the it made of plastic. Which it did happen a few days ago. Thankfully I can say that it survived minus part of the casing fell off (but not damaged, so it did go back on), but it is also easily removable. So it's not to surprising that it did come off. I just got a little bit of a chip in the finish, which is no big deal. I wasn't using the provided tank at the time. Thankfully I the glass I was using didn't break. The battery is huge and where 95% of the weight comes from. My only big issue with the Puxox is the built in battery monitor. I wouldn't say its "inaccurate" but it seems to only take a couple puffs on a full charge to suddenly be down to 92%. But plug back on the charger and its back to a 100% quickly. But I get a good hit all day at work and probably have 33-35% left when I charge back up before bed. The provided tank is small, which is why I wasn't using it the day the mod fell. Small, however, does not mean weak. The tank and coils for it hits like a beast. I just like using another tank I won't have to fill up while at work. The ring you have to remove to fill up the tank is a bit stubborn the first couple times you fill it, but does become easier to remove soon after. All in all its a good product, I use it very frequently. Would recommend as an option for other to look in to.